Flowering plants, mosses and liverworts, a few species of encrusting lichens, the Charales, and other large algal species constitute the macro-phytes of flowing waters (Hynes 1970). Most groups can also be found in standing water, but as one proceeds to faster flows the flora becomes restricted to the small number of species able to withstand current. Taxa almost entirely restricted to very fast currents include two flowering plant families of the tropics: Podostemaceae and Hydrostachyaceae, and a number of bryophytes (Westlake 1975a). Macrophytes exhibit few adaptations to life in flowing water and are most successful in slow currents and backwaters. Certain characteristics permit establishment and maintenance of populations in appreciable current. Tough, flexible stems and leaves, firm attachment by adventitious roots, rhizomes or stolons, and vegetative reproduction typify most macrophytic species. However, Podostemaceae and Hydrosta-chyaceae of tropical torrential rivers possess aerial flowers and sticky seeds, and so are able to reproduce sexually. Macrophytes can be classified according to their growth form, their manner of attachment, and even more specifically by the range of environmental conditions that a species inhabits. Four major growth forms are recognized by Westlake (1975a). Emergents occur on river banks and shoals. They are rooted in soil that is close to or below water level during much of the year, and their leaves and reproductive organs are aerial. Floating-leaved taxa occupy margins of slow rivers, where they are rooted in submerged soils. Their leaves and reproductive organs are floating or aerial. Free-floating plants usually are not attached to the substrate and can form large mats, often entangled with other species and debris, in slow tropical rivers. Submerged taxa are attached to the substrate, their leaves are entirely submerged, and they typically occur in midstream unless the water is too deep. Southern Germany, bryophytes dominated shaded and fast-flowing streams while vascular plants and charophytes were more common in sites with slower current and higher light incidence (Passauer et al. 2002). Macrophytes play an important role in lotic systems for both invertebrates and fish as habitat (Humphries 1996, Bowden 1999) and as refuge from predators (Grenouillet et al. 2000, Harrison et al. 2005). Macrophytes also may increase habitat heterogeneity for aquatic organisms by modifying water velocity across the stream channel and increasing its range of variation, including the provision of low flow areas (Champion and Tanner 2000). By slowing the current, macro-phytes can trap sediments (Schulz et al. 2003) and particulate organic matter (Horvath 2004). 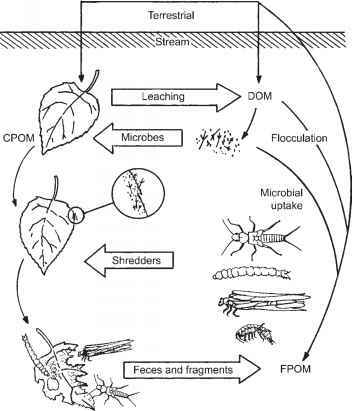 However, these effects likely vary among macro-phyte species, as Sand-Jensen (1998) reported for Callitriche cophocarpa and Sparganium emer-sum in Danish streams. C. cophocarpa forms a dense canopy whereas S. emersum has long and flexible leaves and forms more open patches. Current velocity decreased markedly near the bed of C. cophocarpa, which enhanced the accumulation of fine sediments and elevated the substrate surface (Figure 6.14). In contrast, the open canopy of S. emersum had less effect on current velocity, sediment composition, and topography. Organic matter and nutrient enrichment in the sediments was also higher in C. cophocarpa than in S. emersum patches, emphasizing that macro-phytes should not be viewed as a homogenous ecological unit.